PID #20 Come to the Poconos and enjoy the R&R that you deserve. Whether you are here for summer time fun or a winter getaway, this is the home to stay in. 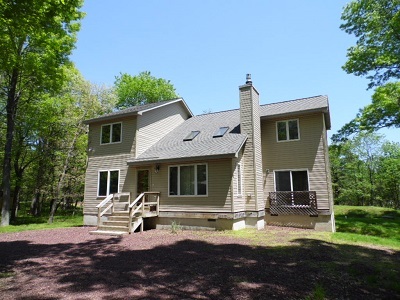 4 bedrooms with a large loft, 2 baths and is located near major Pocono Attractions such as Skiing, NASCAR, Hiking, shopping, etc. Please inquire for actual rates! This home does not have a working phone. Don't forget your cell phones. Our homes are supplied with dishes, cookware, pillows and blankets. PLEASE BRING towels, dish towels, linens and paper products. Linen service available upon request and additional fee. This home accomodates 10-12 people. Please do not exceed this number.